Santa Eulalia is the co-patron of Barcelona and festivals are celebrated this 2014 on 7, 8, 9 and 12 February. Santa Eulalia Celebration in Barcelona is considered the largest winter festivals in the city. Santa Eulalia Celebration is always mainly focused to the family and most of its activities are designed for children. During Santa Eulalia Celebration 2014 various museums in Barcelona will have open doors days. You can check the full list here. How could it be otherwise, there will also be expected is Santa Eulalia Run-Fires. There will be two: one for younger and one for adults. The Run-Fire for children, known as Little Devils Run-Fire, will be Sunday at 7 PM. The tour will be: pl. de Sant Jaume, Bisbe, Pietat, Comtes de Barcelona, pla de la Seu and Av. de la Catedral. Adults’ run-fire will also be on Sunday 9 but at 8.15 PM. It tour will be: pl. Nova, Bisbe, Pietat, Comtes de Barcelona and pla de la Seu. And on 12 February is Santa Eulalia. 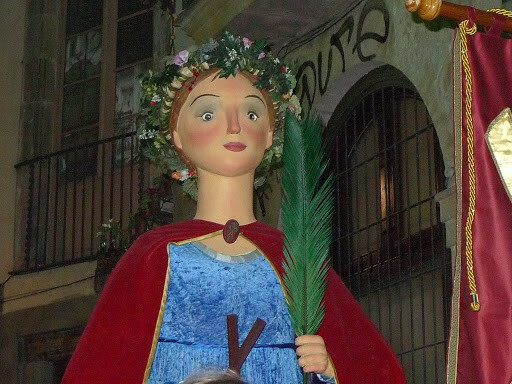 To celebrate, they go out all the giants of Ciutat Vella, who also invited other giant friends. The walk of the giant will be on Wednesday 12th at 19.30. The tour will begin with the Plaça del Pi and continue by pl. the Cucurulla, Boters, pl. Nova, Bisbe, Sant Sever, Baixada de Santa Eulalia, Banys Nous, Ferran and end on the Plaça Sant Jaume, in front of the City Council of Barcelona.